Can you believe that it’s December already? We’re going to be putting up our Christmas tree today. This will be the first year that our little guy helps decorate the tree. We’re pretty excited! Outside of Christmas and New Years Eve, there are plenty of fun bizarre December holidays to celebrate this month. Here are a few of my favorites. December 4th – National Cookie Day: This would be a great day to get started on your Christmas baking. Decorating cookies is such a fun holiday activity! December 12th – Gingerbread House Day: One of my favorite holiday traditions is creating a gingerbread house (although I have a tough time not eating all the decorations!). Here are some fun decorating ideas. December 14th – Monkey Day: There are so many fun ways you can celebrate Monkey Day! If you live somewhere warm, you could take a trip to your local zoo to visit some monkeys. Another fun idea is to play a game of Barrel of Monkeys or a catch game of Monkey in The Middle. Your family fun night could include monkey-themed snacks like banana cream pie. December 21st – Crossword Puzzle Day: Did you know that the first Sunday newspaper crossword puzzle was published on December 21, 1913? Here is a fun & free printable crossword puzzle for all you Disney Junior fans. December 26th – Candy Cane Day: Do you use candy canes to decorate your Christmas tree? Today is the perfect day to start indulging in those delicious candy canes! December 26th – Thank You Note Day: I write thank you notes for everything. A fun & thoughtful activity for your kids would be for them to write thank you notes to family members for the Christmas gifts they’ve received. December 30th – Bacon Day: My husband loves bacon! I haven’t decided if I’ll tell him about Bacon Day yet. Perhaps I can surprise him with a bacon themed breakfast. 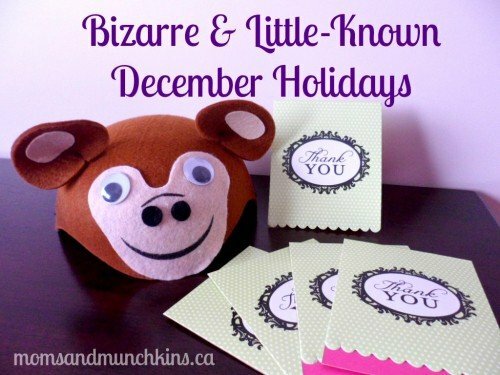 Do you know of any other fun & bizarre December holidays? How many of these bizarre December holidays will you be celebrating? For more silly ideas on celebrating little-known holidays, follow us on Facebook, Twitter, Pinterest and Bloglovin’. These are great – thanks for sharing! I especially like Bacon Day..the possibilities are endless! Yes, my husband is going to love bacon day! I love all of the holidays involving sweets. The Moms Night Out version of December bizarre holidays is coming out soon – there are so many days to celebrate chocolate! Monkey Day! I love it! Might have to celebrate that one!